Read the full job description (PDF, 167.2 KB). Vincent joined Kent County Council in August 2016 and has been the Strategic Commissioner since April 2017. He was a senior civil servant for the 12 years prior, serving in the Home Office firstly and then Ministry of Justice (MoJ). From 2009 he was the Director of Commercial and Contract Management, responsible for a portfolio of £3.5bn per annum. This covered everything from the construction and operation of prisons through information and communications technology to staff uniform. He was also responsible for MoJ’s transport and logistics operations. During his time as a senior civil servant, he was Gateway reviewer for the Major Projects Authority and a Crown Representative for the Cabinet Office working across central government departments on high risk and profile programmes. 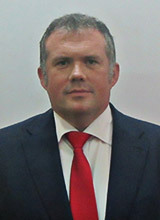 He spent 14 years in the rail industry with various organisations including London Underground Limited and Network Rail. Predominantly this time was spent working on infrastructure, privatisation and outsourcing programmes. Most of Vincent’s roles have been of a commercial nature. He has been a fellow of the Chartered Institute of Purchasing and Supply since 2007 having achieved membership in 1992 and was their Professional of the Year in 2007. The University of Birmingham awarded him an MBA in 1997. Vincent's expenses for the past financial year are £66.74. Spouse is Director of Community Development for West Kent Mind (Charity). The declaration of interest has been taken from Oracle and refers to the financial year 16/17. complimentary pass to Local Government Strategy Forum - 23 - 24 May 2017, including accommodation.